A great designer bridal lehenga that we all drool over occasionally costs nothing less than a small fortune. It will buy is a house, cattle and an army in some part of the world, methinks! We had some pretty inquisitive girls come question us about what Indian brides do with the magnificent designer bridal lehengas once the shaadi tamasha is over. Do they follow in the footsteps of Sharmila Tagore and preserve it to be worn by their daughters in law? So, what exactly can a bride do with her exquisitely designed heavy bridal lehenga? Should she frame the piece, like this one below to preserve the memories? Or wear it when she takes her dog for a walk in the park? Because, kharcha kiya hai, thoda show off banta hai! Or be a daring bride and find innovative ways to trash the dress - like this? Of all the above 3 reasons, which we were just kidding about, seems like Trash the Dress is actually a concept practiced in the West. 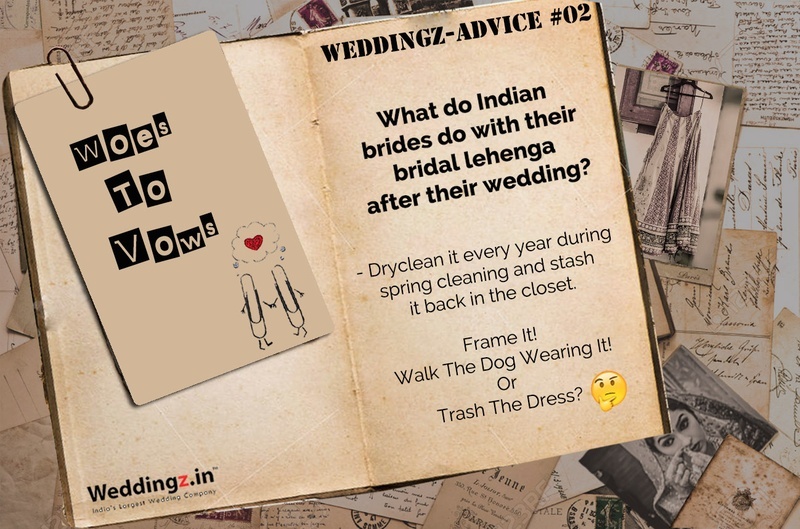 We, however don’t advice you to wade into a pond or go for a morning walk in your Sabyasachi or Manish Malhotra. Here are some practical ways in which you can reuse and re-wear your bridal lehenga without making it look too flashy. Bridal lehengas tend to be heavily embroidered and embellished. If you want to re-use yours, tone down the flash. This is where the trick of mix and match comes into play. While doing so, ensure the elements you mix and match either piece of your bridal attire that is the lehenga, choli and dupatta are teamed with something simple and straightforward. Use the lehenga with a solid colored crop top or even a funky blouse that can be worn without a dupatta. Ace designer Tarun Tahiliani suggests, plain black blouses work wonders when teamed up with any type of bridal lehenga. Similarly, you can team your dupatta with a sleek and upbeat anarkali or salwar kameez and, the blouse with a light or plain and flowy lehenga or a gorg chiffon sarees. Today’s young brides like all things flowy. So, it’s no surprise when it comes to bridal lehengas, brides want a fuller design. You can change the look of your lehenga by simply taking off those layers and layers of buckram that you requested your designer to squeeze in. This is for brides who don’t mind changing the entire look of her bridal lehenga. While stitching up your blouse and lehenga together and converting it into an anarkali is one of the most common options. A lot can be done with your dupatta too. You can convert your dupatta into a chic blouse or create a stunning kaftan or straight cut style kurti. You could also use the borders of your dupatta or lehenga to glam up a plain saree. YES! You heard that right. We are telling you to cut and shred your prized possession, simply because, you can use all of that gorgeous material to create many more fabulous outfits. While designing your own anarkali is one of them, you can create a trunk full of sarees adding the motifs, borders and other fine details of your lehenga to plain sarees. Also, known as tranfer, this technique is used by many designers. Perhaps a small boutique or tailoring outfit can give you great suggestions. If you’re simply planning to preserve it and use as is. We suggest you follow the footstep of Genelia D’souza who wore her bridal lehenga to her brother’s wedding or Liberty Ross who wore her wedding gown to Vanity Fair’s Oscar Party. Just accessorize it differently and try out different dupatta draping styles. Have questions you need advice on? Throw them at us and we will crack it for you. Drop in your concerns in the comment section below.